This was the first audiobook I had listened to in a few months and boy it was a good one! I had been eyeing this one for a while and it was a great introduction back into audiobooks and thriller novels. 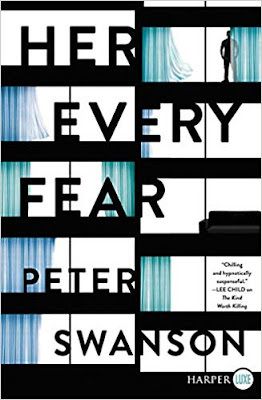 Her Every Fear is written by Peter Swanson and was published in March 2018. The novel follows the journey of a British woman named Kate Priddy (pronounced 'pretty') who switches apartments via 'The Holiday' with her cousin who lives in Boston. Kate backstory is pretty gruesome and she is constantly filled with anxiety and fear over every little thing, which is why she was determined to make this life switch. What she finds when she enters Boston and her cousin Corbin's apartment, is a murder investigation and a whole lot of secrets. We see the point of view of the story switch between Kate and her neighbor Alan Cherney, who becomes very interested in Kate and the murder of their other neighbor, Audrey Marshall. Later on in the story, we get a glimpse of what is going on with Corbin across the pond and the secrets he has been hiding. Throughout the story, we are hit with one revelation after another and the ending will truly have you on the edge of your seat. It was also quite sad and kind of upset me. I can't say too much else without giving away the entire story but I promise you, this was a great book! It kept me on the edge of my seat and one that I so desperately wanted to know the ending too. I also had no idea how it was going to end -- I'm usually really good at figuring out the endings of novels but this threw me for a loop. It was the type of book that made you think one thing and then pulled the rug out from under you. The characters were well developed, the plot was incredible, and even though I listened to it, I know it was well written! If you're looking for a book that will entice you, and keep your attention but was also easy to read I highly recommend "Her Every Fear."